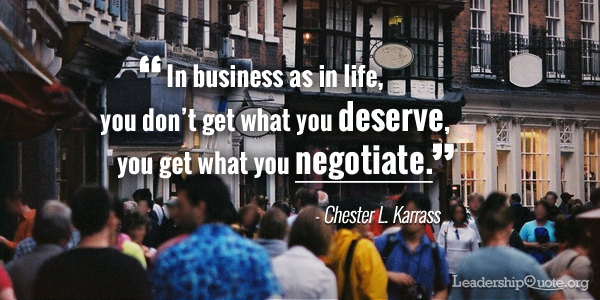 Of all the business skills needed by a leader, that of negotiating is one which will pay dividends over and over again. 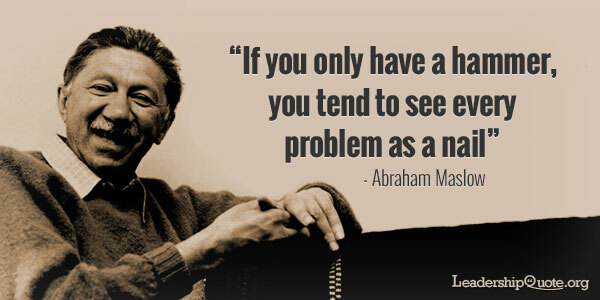 That’s why this is one of my most favourite quotes about leadership and negotiation. I went on a Chet Karrass negotiating course in 1986 and it must have shown one of the best Returns on Investment anyone ever spent on “training”. I don’t remember how much it cost but I do remember it wasn’t cheap. Worth every penny! How do I know it was 1986? I am working with a client at the moment and the subject of negotiation came up. I went to my bookshelf and picked off the two Chet Karrass books. In the front, I had written my name and the date I bought the books, as I mostly do when I buy a book. All day, every day, we are all negotiating with each other. We don’t need a lot of quotes about leadership to know that. Building on the superb foundations of an excellent course, I learnt from the early days to leave myself room to negotiate, to give concessions slowly, bit by bit. I realised that “splitting the difference” is a cheap trick used by thug buyers and not to be accepted. I learnt that a win-win is by far the best outcome for anything other than a one-off deal. I know, now more than ever, that my negotiations are vastly improved by “proper preparation and planning” – which “prevents pretty poor performance”. the 7 “p”s of negotiation. So many of these things are basic, simple to learn and easy to apply and they are remarkably absent from many managers’ and leaders’ toolkits. I am very pleased to see the Karrass organisation is thriving and I have recommended to my client that they review whether to send some of their people on a negotiating course. This has driven me to read some of the Karrass web site. I suggest you pop over there and have a look at it. Some excellent free stuff. I take the very unusual step of putting an external link into this article http://www.karrass.com . Just for clarity, I do not have an affiliate relationship with the Karrass organisation. I am not writing this article to make any money from anyone. It is a way to say thank you to Chet Karrass for a fantastic contribution to my business and personal life over the last 26 years – with the expectation that this will continue over the next years. How Many Skills Do You Have in Your Toolbox? Do you have good knowledge and skills in the broad range of tools which are suitable for your chosen profession? I suggest you need to carry out an audit and see if you have any gaps. You almost certainly will have some. Write a plan to bridge them and work through that plan in a systematic way over the next months and years. I’m not suggesting that you need to be an expert in every area; in fact, quite the opposite. You need to know enough about the subject so that you can decide who has the knowledge, who is skilled and has the high level of expertise that you will need to support you in all the technical and business disciplines. Without a reasonable knowledge in a broad range of skills in your chosen area, how would you know how to pick the really good people? Surround yourself with people who are better than you in each individual area. They don’t have to be full-time employees. Freelancers are fine. For example, a couple of hours a month from a top Finance Director will bring you huge value in a highly technical discipline. You will gain far more than the cost, with ideas and new angles as well as potential savings. In your learning plans, please consider the changes we are all facing and those we will continue to face. Peter Drucker, who also authored plenty of excellent and famous leadership quotes, was the management writer who introduced and defined management as a profession in its own right. He wrote extensively on the subject of “knowledge workers” and said that nearly everyone in the future will have a succession of different jobs during their lifetime. They will have more than one “career” and often more than one job at the same time. Individuals will have to treat themselves as a “corporation” and run their careers as if they are a business of which they are the “CEO”. This is in such contrast to the “job for life” mentality and expectation of the second half of the 20th century. I look back over the last 50 years and recognise the changes that have taken place and the increasing demands on our knowledge and intellect. For me, it is a paradise of new things and new opportunities. I really hope that you share my delight. I implore you to continue your search for knowledge – but then you are already convinced because you are reading these articles every week and you want inspiration to move you to acquire new knowledge and skills. Apple nearly axed the iPhone! Sir Jonathan Ive, Apple’s design chief, said that Apple nearly axed the iPhone before its launch in 2007. There is no doubt (in my mind at least) that the iPhone had several design flaws when it was launched but despite that, it was such a huge step forward in technology and design that it would have been a travesty not to have launched it. Yes, it was and is a great product and Apple have a design philosophy which says they will only launch great products. I don’t think even they would say that the iPhone is perfect. You and I have done it too, perhaps not on the scale of the Apple decision but even so it can be a major stumbling block even at the day-to-day level and even more so for the major business decisions and projects. Spend too long on that email, “improve” that agenda, re-write that proposal. Of course it must be right, but in many cases, it is right already. And it must be on time too. Delayed a product launch when it could have been out on the market and making money even if it wasn’t “finished”. I’ve seen it with project teams and with individuals working on important documents. Too much time spent planning, allowing procrastination to waste time at the beginning, then the final date is missed, sometimes by a large margin. These missed deadlines were rarely through a lack of knowledge, care or talent. They were due simply to running out of time. Procrastination at the start and sometimes during the project meant there wasn’t time to execute the plans well enough. That’s an inspirational leadership quote right there. Remember the application of the Pareto principle in this case. It takes 20% of the time to complete 80% of the task. The remaining 20% of the task can take 80% of the time. Aside from the iPhone, there are many examples of projects which have been put off and nearly not launched at all. If you have put in 80% of the effort and you have a product ready, provided it is not defective, launch it! You can always improve it later and add all the bells and whistles. Put it out there and let it start doing its job. If it is a product, let it start earning. If it’s a website, let it start bringing in clients. Don’t wait until that final design feature is up and running. Don’t spend forever adjusting the colours and the page structure. Go for it! 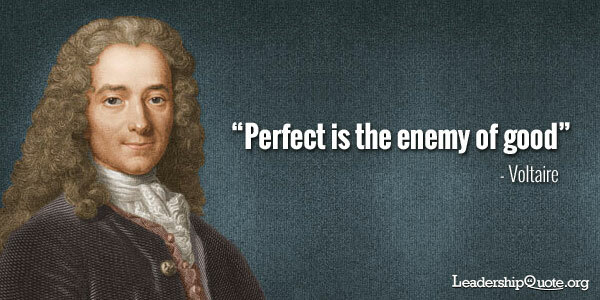 So, make sure perfect is not the enemy of your good. Make a start on time, set a deadline for the completion of the first draft and leave yourself time for a re-write or a re-vamp – or even two. Then deliver on time, launch that product and be happy with your effort. Or, if you need another nudge, you can read about other inspirational leadership quotes on my blog. Do You Spend Your Time or Do You Invest It? Do you spend time or do you invest it? What is the difference? Let me ask you a different question to help with the context. How much does your TV cost? When I ask people that question most of them go off and tell me what sort of TV they have and how much it cost them. Did it is cost you 500, 1000 dollars, pounds? Is it 42 inch, 50 inch, is it LED? Is it 3-D? You see, I didn’t ask you how much you paid for it. The question was in the present tense. What you paid for it isn’t what it’s costing you. Now let’s put a value on it. How many hours a day or a week do you watch the TV? Let’s say you watch two hours a day on average. That is over 90 working days a year at an eight-hour day. In a normal working pattern, that is four months or more. Let’s just reflect on the cost of that for a minute and we might start to get an idea of how much your TV cost you. Okay, let’s say you are being paid 30,000 a year and that therefore, four months of your time is worth 10,000. How much would your business have to take in sales to drop 10,000 a year to the bottom line? Depending on the margin of your business I suggest it’s between 20,000 and 200,000 a year. If you are used to doing margin calculations, you will know how much your business makes as a margin. You will also know your compensation package. It’s probably more than 30,000 a year, isn’t it? I suggest to you therefore that your TV is costing you between 20,000 and 200,000 a year. It wouldn’t be difficult to come up with a bigger figure would it? One thing for sure, your TV doesn’t cost you $500 or £500. Now let’s talk more about this great leadership quote. As an aside, if you spend a lot of time watching news programmes, I suggest you probably feel down at the end of them very regularly as well. Does that help you? It’s worth asking because I know that when I watch less news, I feel better for it. Of course, you should keep up-to-date with current affairs and if there is a specific area which is relevant to your life or business, then you certainly need to concentrate on that if there is a major issue within it. Motivation and positive thinking is a subject for other Quotes of the Week but I think you understand my point. And if you say to me, I don’t spend that sort of time watching TV, I bet you spend that sort of time doing something that you’re not particularly proud of when you stand back and think about it. How could you invest that four months a year? I suggest you should invest your time in yourself. You can learn a lot in four months. Invest the time improving your knowledge in a specific area which will help you in your life. Improve your knowledge and skills and the return on your 20,000 (200,000?) investment will be many multiples over the next years of your life. You have nothing else to invest. So, I ask you again. Do you spend your time or do you invest it? Remember, time is your only real capital and it is the only thing you cannot afford to lose. 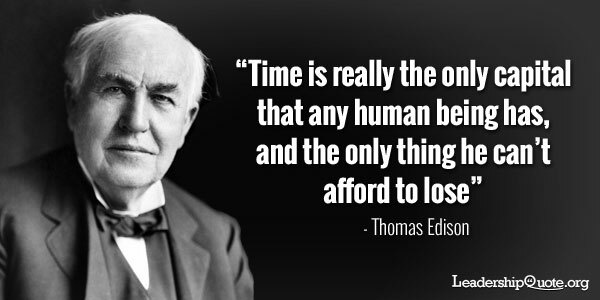 Listen to Thomas Edison and use these wise words to inspire you to invest your time in yourself. You are always under the spotlight as a leader. People will show great interest in you and how you conduct yourself. This was brought home to me in my career many times. People will report back nuances of behavior, ask questions about why you did certain things or how you did another thing. I was walking through the factory one day and a woman asked me how long I’d had my boat. I never had a boat, but somebody had searched for my name on the Internet and discovered that another individual with my name – not me – owned a boat. There was indeed quite a lot of detail about this individual. So they were showing an interest in me and this really emphasises how you need to manage your online presence as a leader as well. Those you lead are interested in your personal life and will draw conclusions from what you do even if those conclusions are way off the mark. They will tell you things about yourself that you didn’t realise or even that you didn’t know. 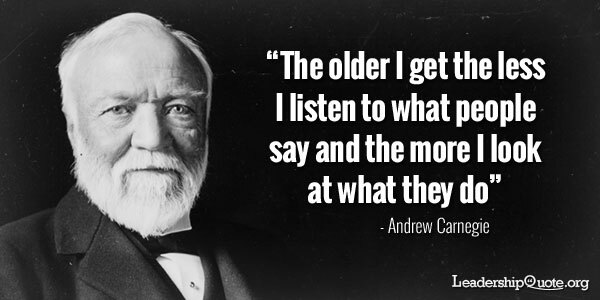 As Andrew Carnegie said, in one of his more famous quotes about leadership, “What people do is noticed more than what they say.” Over a short period of time, people will listen, interpret and absorb what you say. Since you are in a position to influence their lives, sometimes in quite a big way, they will also watch to see if what you do matches what you say. Over a longer period of time they will watch closely to see if what you say matches what you do. We are not just talking about body language here, although that is crucial. We are talking about what car you drive, what time you turn up in the morning, your tone of voice when dealing with people. All those small and large things go to make you up. And always remember, the first impression is usually the last impression.